I got to spent two days at an amazing retreat this past weekend, and I’ve finally had time to upload my photos (and to steal the photos of Mark’s weekend). The Creative Alliance at Calliote Canyon was an amazing experience. I’m not even sure how to write about the awesomeness. Sure, I could tell you about the food, and the wine, and the late night conversations. I could tell you about reconnecting with old friends and making new ones. 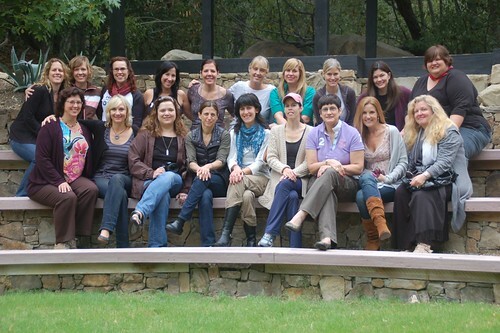 I could tell you about the magic that happens when a bunch of brainy women get together and I get to absorb it all. I could tell you about the side-splitting laughter, and the insane vulnerability, and the comfort of being understood. I could tell you about a group of women honestly grappling with the balance between being a fully-present mom and a woman with other passions. “I’m slowly learning that this blogging thing really can lead me to real friendships, it’s just simply a newish avenue to the same place. That’s why after we connect through each other’s words, we can’t help but say I need to see her. Because friendships need faces and voices and time, in person. Sooner or later. Yes. What Heather said. (And seriously, go look at the slideshow she made of the retreat. It really captures the whole thing). I am so, so honored I got to be a part of this weekend with many women I admire. On Saturday, I was able to lead a discussion (with Danielle and Kim) about using blogging for good . . . and it was inspiring to hear the different ways people are using this new social medium to raise awareness for different causes. An idea was born out of this discussion that I’m excited to put into motion. I was also honored to be a reader at Listen to Your Mother on Saturday night. It was an evening of women reading their own work . . . but it was so much more than that. It was like a group therapy session where each reader was speaking my own truth. Again, no words to describe this. Again, so I’ll plagiarize. (Surprisingly, plagiarism was NOT one of the lessons I gleaned from the weekend. But I’m tired and these ladies say it so well). Yeah. That’s what it was like. It appears that my husband was involving the children in some sort of Lord of the Rings re-enactment, with Karis as Frodo Baggins. Then Mark took Jafta to his first USC football game. Jafta’s got his gameface on. Something tells me this won’t be the last. Mark took the kids to Wahoo’s for dinner. No suprises here – Mark always takes the kids to Wahoo’s when I’m out. It’s their thing. If you aren’t familiar with Wahoo’s, all I can say is, I’M SORRY. There is a reason those of us in the OC pay 300% more for our homes than most of the country. And that reason is Wahoo’s. (Okay, it might also be the beach proximity and moderate climate. But Wahoo’s is up there). The kids partook in a little Dance-A-Lot Robot before bed. That’s our sliding glass door. Jafta was trying to close it and it shattered. Thank God no one was hurt. Murphy’s Law that it happened while Mark was alone with four kids. We now have a gaping hole in our living, as we wait for a new custom slider to be built to the non-conforming 1950’s house specifications. Mark did some creative work with a tarp and some duct tape, and for now we are just enjoying that ocean breeze and temperate climate. Or not. Since it’s been raining and storming for the last three days, OF COURSE. Oh well. I suppose I did tell myself that I wanted “get back to nature” during my time in Ojai. And now I have a living room exposed to the elements. See what happens when you set goals?